Maureen’s last post gets us almost to our recent hotel-home in beautiful Belmont, California. We’ll catch you up shortly as to what we did there and where we’re headed next. In the interim, I wanted to write a little bit about transportation here in the Bay Area, as some of it has seemed a bit opaque to us as new users. Before you read the rest of this post, you may want to check out this WikiTravel page, particularly the map of the regions, in order to have a mental picture of the sub-regions of the Bay Area. First, the bike paths. There appear to be quite a few dedicated bike paths in the area, notably the Bay Trail. However, despite visits to a few local bike shops, we were unable to find a decent bike map of the Peninsula. Good biking maps are available for the city, the East Bay, and mountain trails, but maps that included our local area were at a scale that would not be useful. So, we rode the nearby paths and made the most of it. I would not, however, want to bike for errands, as the roads on which stores are located tend to be very busy. Second, driving. It is California, after all, people drive. Lots of people drive. Unless it’s rush hour (which lasts a pretty long time in the afternoon/evening) or a popular route to the beach on a holiday weekend (we had good reason for doing this, we’re not just gluttons for punishment), this is a pretty straightforward way to get around. The GPS tells you where to go, and routes are reasonably well-signed. People drive fast and pass on the right as well as the left, though, but this is really no different than anywhere else (though maybe faster than most places we’ve been in the U.S.). I do advise a smaller car than a mini-van for this area. Parking places and lanes on the highway seemed quite narrow in our Sienna. I can’t even imagine driving a full-size SUV here. And, surprise, you don’t see that many of them. Finally, Public Transit. This category has a few subcategories, because all the systems are different. Sigh. This is the main transit system connecting the Peninsula and South Bay to San Francisco itself. It is “heavy” rail, much like what you see in Europe. The best thing about this system (IMHO) is its bicycle cars. 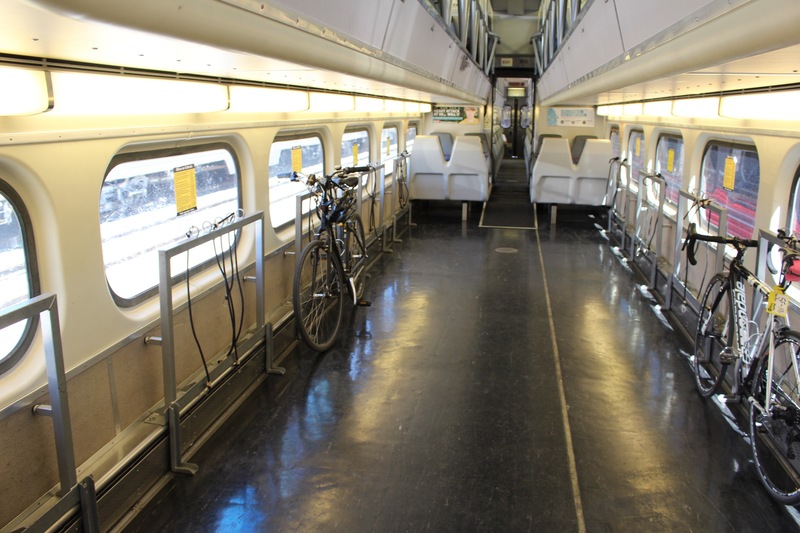 While you do still have to navigate some steps to get in, there is a lot of room for bikes! 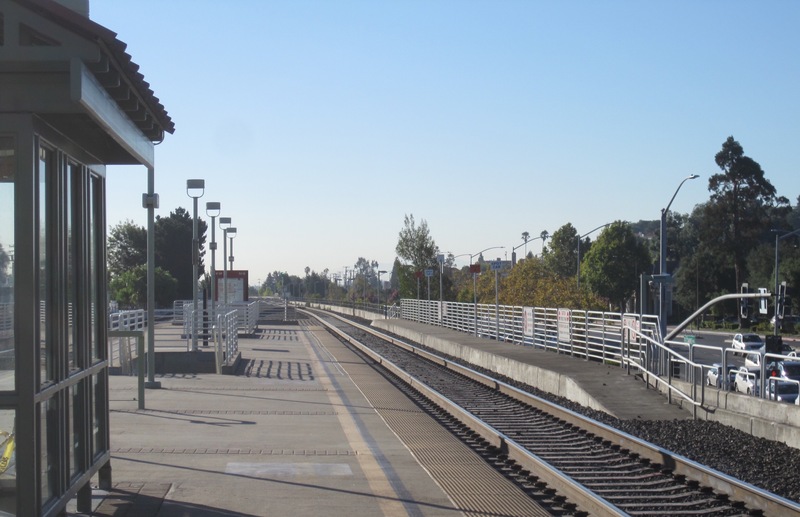 One downside of Caltrain is that it runs relatively infrequently–once or twice an hour, depending upon the time of day–so you need to plan your trips. Another thing that was a minus for me was that the express trains travel on the same (only) set of tracks as the regular trains, which means they can come roaring past you while you wait on the platform. Scary. 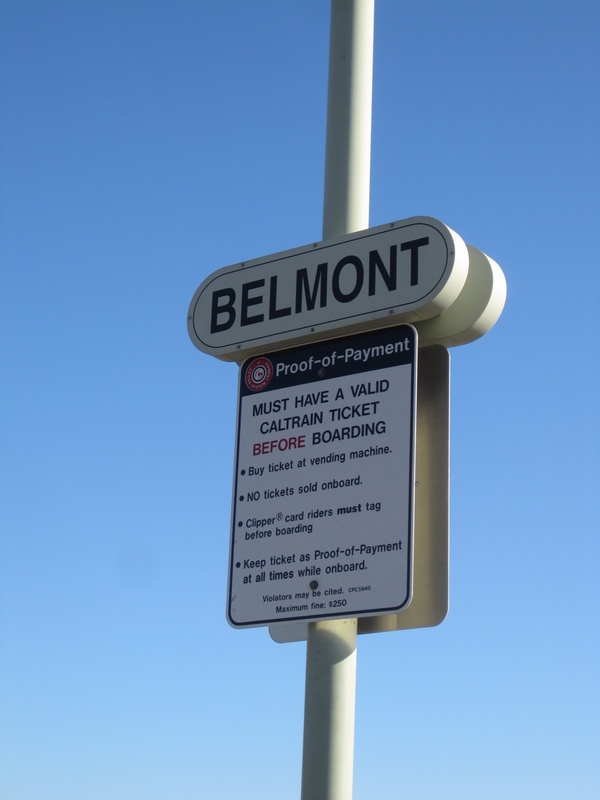 Parking at the Caltrain station nearest us (Belmont) was easy and is free now, but that will change at the end of this year. Bay Area Rapid Transit uses “high-speed” electric rail and primarily serves San Francisco, Alameda, and Contra Costa counties. It was originally intended to serve a larger five-county area, but San Mateo and Marin counties ultimately opted out. (Some history here.) It is similar to the Metro in DC or the Tube in London, with entry and exit gates at each station and a mix of underground and above ground tracks and stations. I took only one round trip on BART, so I don’t have much to say about it. The most helpful people we encountered while using transit were the BART ticket booth personnel. One helped us understand how the Clipper card (see below) works, and another helped Maureen “top up” her Clipper a few days later. San Francisco’s Municipal Railway includes light rail, streetcars, buses, and the famous cable cars. Though I have ridden most of these in the past, I had only one Muni experience this time–a short light rail ride from the terminal SF Caltrain station to Embarcadero Station. It was slow and there was no transfer discount for coming off Caltrain. It was also clean and easy to figure out, big plusses in any transit system. The one unified part of the SF transit system is the payment card, here known as a Clipper Card. Not all train/bus stations sell Clipper Cards, but it appears that all Walgreens stores do, and have the capability to add value to the cards. If you need to do these things, head right to customer service (often what used to be the photo counter), since that’s where the Clipper charging device (cashier operated) is usually located. There’s also a Clipper Card service shop located in the Ferry Building. Both of these options were superior to topping up in the SF Caltrain station, which had only two machines, one of which was out of order, and allowed a minimum addition of $20. Clipper saves you about 50 cents per Caltrain ride, a similar amount on BART, and the hassle of finding someone to take your money on Muni (and finding exact change). It also “remembers” when you should get a transfer instead of a full-fare ride. Unlike the Oyster card in London, there is no daily cap on what you are charged, so if you are making several trips in one day (on the same system! ), a paper daily pass may be a better deal. The oddest thing about the Clipper Card is how differently it works on the different systems. On BART, it operates the gates in and out at your beginning and ending stations and deducts value accordingly at the end of the trip. On Caltrain, when you “tag in” (the stations are not gated; there are several machines to tag your card), the system immediately deducts the maximum fare for travel from your current station. This can be up to $12.50, so it’s a little disconcerting the first time it happens! Fortunately, the difference between the maximum and your actual fare is refunded when you tag out at your terminal station. However, if you forget to tag out–no refund!! I was wondering if perhaps my public transportation skills were sliding, as I was finding SF transit quite confusing. I was quite relieved, then, to have a conversation with a friend who has been living in the Bay Area for a few years (and who is a veteran user of other transit systems) in which she expressed similar frustration with the disconnections among the SF Bay systems. In summary, the area is well-covered by transit, but do your research when deciding where to stay and how to travel, preferably using no more than two systems per trip–one if possible.